One of the most surprising applications for our work with developmental and subcellular psychobiology is in the field of psychologically induced pathogen immunity. In other words, a therapist can do a fairly simple, quick therapy procedure and have the client's disease symptoms vanish in minutes to hours. The field of psycho-immunology (or the equivalent psychoneuroimmunology) has been in existence for more than thirty years. It started with attempts to understand the biology behind the 'placebo effect', where roughly a third of all medical patients (depending on the disease) will actually be cured if they believe that their medication will work. This is one reason why clinical drug trials are so difficult - the drug companies have to demonstrate that their drugs are more effective than ordinary sugar pills (the placebo threshold is about 30% for most diseases). However, the bright promise of a psycho-immunology approach to healing has faded over the years. As time passed, the field moved away from the idea of psycho-immunology, mostly because it didn't lead anywhere. Sadly, as the underlying biology was never solved, reliable, simple techniques did not materialized. The few groups still working in it have been reduced to just looking at the influence of stress relief. Instead, interest moved to more effective 'alternative' or 'complementary' therapies and approaches (acupuncture, trauma healing, diet, etc.) that proved effective in treating various diseases and disorders. Why these techniques work is not understood, limiting their acceptance among conventional medical researchers, but that they work is finally being accepted, especially by the public. We did not set out to solve the problem of psycho-immunology. Instead, we were working to understand the cause of exceptional states of mental and physical health. This led to developing techniques that could reliably eliminate various types of trauma. And this in turn led to the discovery of subcellular psychobiology - how psychological techniques could be used to repair subcellular damage and disease. Thus, trauma and subcellular psychobiology treatments focus on treating people's psychological distress and disorders, and are effective and quick. "Why does the insides of a single cell even matter? Well, in general it does not - but we are not looking at an ordinary cell. Instead, we look at the 'primary cell' - a pluripotent stem cell that sets the pattern of health and disease in the entire body. 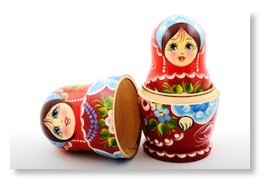 Our biology is a bit like that of a Russian doll, with one doll inside the other. The health of the tiny cell organelles in the primary cell reflect outwards into the health of the larger, corresponding multicellular organs of the body. Thus, healing problems in this cell causes the body to heal the corresponding problems, and amazingly quickly. But haven't we just moved the problem of what to do from an easy place to look at (our bodies that we can chop up or look at through microscopes), to a submicroscopic place that is really tough to look at? Well, yes, it is tougher, but so is getting gold out of a hard rock goldmine. It takes more equipment and effort than picking up nuggets in a stream, but if that is where the gold is..."
From a research viewpoint, subcellular psychobiology is also a wonderful investigative tool. It allows us to find the underlying causes of a disorder - be it a pathogen, gene, or structural problem - inside the cell. Obviously, for many diseases the pathogen is already known (such as the spirochetes that cause Lyme disease). But most of our work is focused on diseases of unknown origin. And this is where working inside the cell itself really shines! We use this approach to find the cause of symptoms; and if it is a pathogen, we can then specifically target it. In fact, this approach lends itself well to laboratory work; once a pathogen is potentially identified, then conventional techniques can be used to verify it and find drug treatments. This is where we get to the immunity part of the discussion. It turns out that pathogens are there because the body wants them to be there. This idea doesn't appear to make any sense - after all, who wants to be sick? But when one starts working at the subcellular level, we find it is more than just biology; these subcellular structures are the basis for our physical and emotional responses. For example, a lung bacteria feels like missing friends, and act as a 'sensate substitute' when we're lonely. Or perhaps we're missing something inside our cell, perhaps for damage or from an epigenetic problem, and the pathogen help us feel better, like smoking helps a person who is anxious. The reasons vary, and are often very indirect, but they exist. So how does one induce immunity? Well, it boils down to developmental psychobiology. The research team backtracks through time looking for the original infection. Sometimes this involves a series of different sequential infections, as in the case of Lyme disease. Once the original infection moment is identified, the reason why the body wants the disease has to be found. Fortunately, people are very consistent at this level. The exact moment this problem occurs is the same from person to person, making treatment techniques far simpler. Then more research is involved, to find the cause and a treatment for this underlying need. Generally, the cause is a generational issue, albeit sometimes a very indirect one. Once this cause is eliminated, the body immediately responds and rapidly gets rid of the pathogen. This shows up as almost instant symptom relief, making it easy to check for quality control during the office visit. Amazingly enough, this approach not only eliminates a current infection, but can also be used to pro-actively immunize a person before they are exposed to a pathogen. In this discussion, we've focused on pathogens and immunity. However, it turns out that the same techniques and subcellular biology approach can be used to make people's organs resilient to stress and mechanical insults. For example, let's look at traumatic brain injury (TBI). If you get ten people in a row, and bang them on the head (sort of like what football teams do when the ball is hiked), there will be a range of responses. Some people who are very susceptible will be severely injured and disabled. Others who are very resilient will simply shrug it off and go on without any symptoms. And most people are sort of in the middle, having some resilience and some susceptibility. This problem is caused during very early development. By repairing specific epigenetic, inherited damage, one can restore the underlying subcellualr structures to full health, causing them to reach a maximum resiliency. For someone who is already injured, the affected system will repair itself quite rapidly, in the order of minutes to hours. And again, this can be done pro-actively, making a person resilient before they are injured. Although the concept of psycho-immunology has existed for decades, it is not until the advent of subcellular and prenatal developmental psychobiology that real solutions became possible. This newly emerging field of psycho-immunology is the next frontier of medicine. Given the problems of antibiotic resistance, the cost of chronic illnesses, and the lack of access to medical help in the third world, this new approach has the potential to change the face of medicine. "Where are the 'medical' applications?" (May 2016) Research blog by Dr. Grant McFetridge. "Snake oil, or the real deal?" (May 2016). Research blog by Dr. Grant McFetridge. "Subcellular psychobiology is a 'disruptive technology'" (May 2016). Research blog by Dr. Grant McFetridge. "Epigenetics, psychoneuroimmunology, and subcellular psychobiology" (May 2016). Research blog by Dr. Grant McFetridge. Peak States of Consciousness, Volume 2 (2008) by Dr. Grant McFetridge and Wes Gietz. Subcellular Psychobiology Diagnosis Handbook (2014) by Dr. Grant McFetridge. Nov 30, 2017: New webpage to go along with the website reorganization.